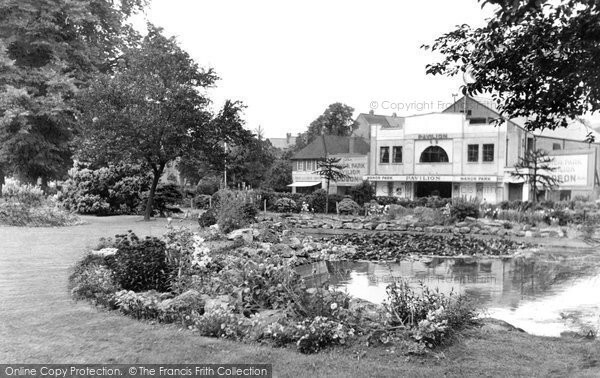 Pavilion Cinema In Background Before They Put The Railings Round The Pond - a Memory of Aldershot. This picture was taken before they put the railings round the pond. One Sunday on my way home from Sunday School at Christchurch, I was feeding the ducks and my Bible flew out of my hand. I tore the back of my leg on the barbed wire on top of the iron railings as I climbed over to get it back. The fair came to the park and there was a wonderful playground at the top and the Hero's shrine at the St Michael's end. The bowling green and tennis courts were at that end too. A memory shared by Pam Odam on Feb 20th, 2013. Send Pam Odam a message.